Eugene Paul Wigner (usually E. P. Wigner among physicists) (November 17, 1902 – January 1, 1995) was a Hungarian physicist and mathematician. He received the Nobel Prize in Physics in 1963, "for his contributions to the theory of the atomic nucleus and the elementary particles, particularly through the discovery and application of fundamental symmetry principles." Some contemporaries referred to Wigner as "the Silent Genius," and some even considered him the intellectual equal to Albert Einstein, though without the prominence. Wigner is important for having laid the foundation for the theory of symmetries in quantum mechanics as well as for his research into atomic nuclei, and for his several theorems. Wigner was born in Budapest, Austria-Hungary (now Hungary), to a Jewish middle-class family. At age 11, Wigner contracted what his parents believed was tuberculosis. They sent him for six weeks to a sanatorium in the Austrian mountains. During this period, Wigner began to develop an interest in mathematical problems. From 1915 until 1919, concurrently with John von Neumann, Wigner studied at the Lutheran Fasori Evangélikus Gimnázium where they both greatly benefited from encouragement by the legendary mathematics teacher László Rátz. In 1919, to escape the Bela Kun communist regime, the family briefly moved to Austria, returning after the downfall of the Kun government. Partly as a reaction to the prominent presence of Jews in the Kun regime, the family converted to Lutheranism. In 1921, Wigner studied chemical engineering at the Technische Hochschule in Berlin (today the Technische Universität Berlin). He also attended the Wednesday afternoon colloquia of the German Physical Society. These colloquia featured such luminaries as Max Planck, Max von Laue, Rudolf Ladenburg, Werner Heisenberg, Walther Nernst, Wolfgang Pauli, and—most famously of all—Albert Einstein. Wigner also met physicist Leó Szilárd, who at once became Wigner's closest friend. A third experience in Berlin was formative. Wigner worked at the Kaiser Wilhelm Institute, and there met Michael Polanyi, who would become, after László Rátz, Wigner's greatest teacher. In the late 1920s, Wigner deeply explored the field of quantum mechanics. A period at Göttingen as an assistant to the great mathematician David Hilbert proved a disappointment, as Hilbert was no longer active in his works. Wigner nonetheless studied independently. He laid the foundation for the theory of symmetries in quantum mechanics and in 1927, introduced what is now known as the Wigner D-matrix. It is safe to state that he and Hermann Weyl carry the sole responsibility for the introduction of group theory into quantum mechanics (they spread the "Gruppenpest"). See Wigner's 1931 monograph for a survey of his work on group theory. In the late 1930s, he extended his research into atomic nuclei. He developed an important general theory of nuclear reactions (for instance, the Wigner-Eckart theorem). By 1929, his papers were drawing notice in the physics world. In 1930, Princeton University recruited Wigner and Von Neumann, which was timely, as the Nazi Regime in Germany emerged. At Princeton in 1934, Wigner introduced his sister Manci to the physicist Paul Dirac. They married, and the ties between Wigner and Dirac deepened. In 1936, Princeton did not rehire Wigner, so he moved to the University of Wisconsin-Madison. There he met his first wife, a physics student named Amelia Frank. Yet she died in 1937, leaving Wigner distraught. On January 8, 1937, Wigner became a naturalized citizen of the United States. Princeton University shortly invited Wigner back, and he rejoined faculty in the fall of 1938. Though a professed political amateur, in 1939 and 1940, Dr. Wigner played a major role in agitating for the Manhattan Project, which would develop the first atomic bomb. However, he was by personal preference a pacifist. He would later contribute to civil defense in the U.S. 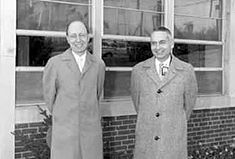 In 1946, Wigner accepted a job as director of research and development at Clinton Laboratory (now Oak Ridge National Laboratory) in Oak Ridge, Tennessee. When this did not work out especially well, Wigner returned to Princeton. In appreciation of Professor Wigner, written 1987, Alvin M. Weinberg stated: "…this tract of Wigner’s [giving credit to his young collaborators] explains why so much, not only of reactor theory but of theoretical physics from 1930 to 1965—though it may not bear Wigner’s name—actually has origin in a suggestion made or question asked by Professor Wigner." In 1960, Wigner gave a thought-provoking insight into the power of mathematics in his best-known essay outside physics, now a classic paper, The Unreasonable Effectiveness of Mathematics in the Natural Sciences. He argued that biology and cognition could be the origin of physical concepts, as humans perceive them, and that the happy coincidence that mathematics and physics were so well matched, seemed to be "unreasonable" and hard to explain. Even so, he found resistance to this theory, notably by distinguished mathematician Andrew M. Gleason. In 1963, Wigner received the Nobel Prize in Physics. He professed never to have even considered the possibility that this might occur, and added: "I never expected to get my name in the newspapers without doing something wicked." He would later go on to win the Enrico Fermi award, and the National Medal of Science. He was a member of the advisory board of Accuracy in Media and was a member of the advisory board of Western Goals Foundation. Wigner received the $200,000 Founder's Award from the Rev. Sun Myung Moon, head of the Unification Church, at the 1982 International Conference on the Unity of the Sciences (ICUS). In 1992, at the age of 90, he published a memoir, The Recollections of Eugene P. Wigner with Andrew Szanton. Wigner died three years later in Princeton. One of his significant students was Abner Shimony. His second wife was Patricia Hamilton Wigner, widow of another physicist, Donald Ross Hamilton, retired Dean of the Graduate School at Princeton University who passed away in 1971. Near the end of his life, his thought turned more philosophical. In his memoir, Wigner said: "The full meaning of life, the collective meaning of all human desires, is fundamentally a mystery beyond our grasp. As a young man, I chafed at this state of affairs. But by now I have made peace with it. I even feel a certain honor to be associated with such a mystery." He developed interest in the Vedanta philosophy of Hinduism, particularly with its ideas of the universe as an all pervading consciousness. In his collection of essays (Symmetries and Reflections—Scientific Essays), he commented "It was not possible to formulate the laws (of quantum theory) in a fully consistent way without reference to consciousness." Also in the realm of theoretics is the thought experiment, Wigner's friend paradox. It is often seen as an extension of the Schrödinger's cat thought experiment. The Wigner's friend experiment asks the question: At what stage does a "measurement" take place? Wigner designed the experiment to highlight how he believed consciousness is necessary to the quantum mechanical measurement process. Historically, physicists were confronted with a confusing morass of experimental data about the atom. It was Wigner who realized that, with rotational symmetry and group theory, order could be wrought from the chaos. This insight later played a central role in understanding the atomic nucleus and subatomic particles. ↑ E. Wigner, Zeitschrift f. Physik, vol. 43, pp. 624-652 (1927). Wiger, E. P. Gruppentheorie und ihre Anwendungen auf die Quantenmechanik der Atomspektren. Vieweg Verlag: Braunschweig, 1931. History of "Eugene P. Wigner"
This page was last modified on 12 August 2017, at 15:05.